The Dimension 4 Clip Rack provides a foundation for a wide variety of productivity and storage accessories. With this added versatility, a Dimension 4 workstation is easily configured for any worker…any task. Reconfigure as needs dictate! The components attach to a steel support frame bolted to the workstation’s vertical uprights above the worksurface. 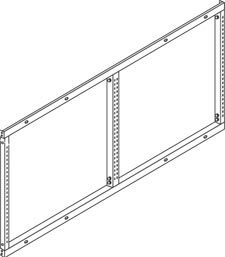 Rear brackets on the end of the shelves, cabinets and other components slide firmly into the slots on the clip rack’s vertical frame in three places. Standard Heights: 24", 30", 36"